My name is Max Lamm and I am 13years old. Five years ago I started to lose what little vision I had. I hated learning to use the white cane even though it did help me get around. My parents promised me that they would investigate getting a guide dog. My dad was denied by several guide dog groups because of my age, I was almost 11 years old. One night, my dad was researching guide dogs and came across MIRA. He immediately called, Bob Baillie, and inquired about the foundation. Bob was going to be in the Philly area where we were going to be visiting and agreed to meet us…it was meant to be! I loved Bob’s dog, Devon, instantly! I was working so hard with orientation and mobility with a cane; I couldn’t imagine how different it would feel with a dog. I knew how different I would look with a dog and not a cane, though, and at my age, appearance is everything!!! April 2011 I traveled to North Carolina to have my orientation and mobility skills tested as well as see if I could handle a guide dog. It is a feeling that I cannot explain when I was holding on to a harness and not a cane. I worked hard and it paid off, I was headed to Canada that summer. Five days after my eleventh birthday my mom and I flew to Canada to start the journey. Training started when we got there and never ended until I boarded my airplane to go home. I have never worked so hard in my life. The trainers and staff were awesome. I learned to speak a little French because that is what my dog, Seal, understands. It was difficult at times to be away from home but it was short term and I knew I would leave with a new best friend. Seal is a handsome St. Pierre breed. A mix between a Labrador and a Bernese Mountain Dog. I am constantly told that Seal is so beautiful and that his eyebrows are the cutest! Seal fit right into our home immediately. If you own a dog you know the responsibility of caring for them and I do it well. I brush his teeth and fur, feed him daily, take him outside, and work on maintaining his command and street skills. Seal rides the school bus with me everyday and goes to all my classes. His least favorite class is gym class because he has to sit at the side of the gym and watch me. He is the best snuggler and best friend. I like to do things for myself and Seal allows me to do this while not holding on to someone’s arm or a white cane. When I am out I am stopped at least twice by people who want to talk about the dog and how great we look together. I was never told that when I used the cane. I am proud of myself and continue to work hard so I will be as independent as possible. Hi, I’m Maddie Link, a high school sophomore at Allentown Central Catholic High School. I enjoy the company of all my friends, but especially that of my furry, four-legged companion, Snowbird. I was matched with my MIRA guide dog in July of 2012, and he and I travel everywhere together. Snowbird has been to the United Nations, Lake Seneca, and Bethlehem’s MusikFest and on the Washington DC Metro. He even guided me all the way up the 832-step Gorge Trail at Watkin’s Glen State Park in New York, and then all the way back down, through tunnels, past cascading waterfalls, beside cliffs, and down spiral staircases cut into solid stone. 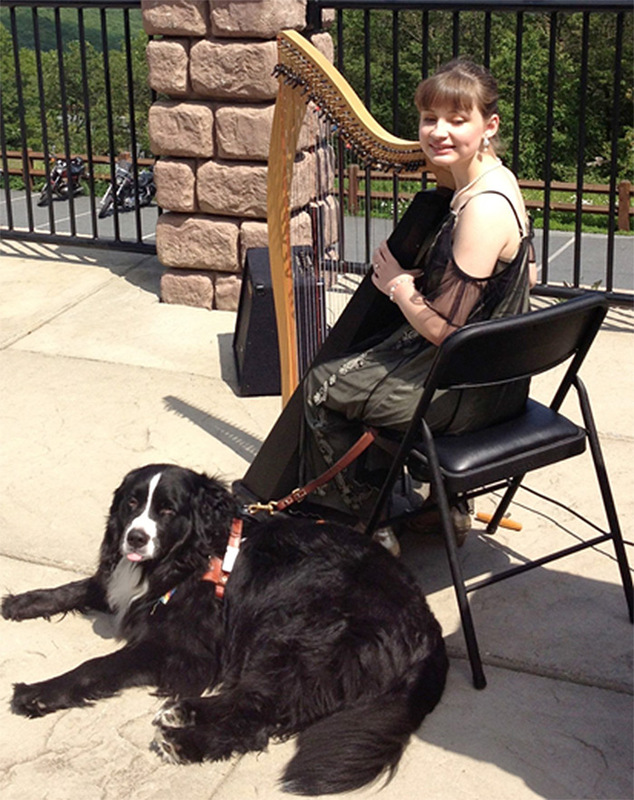 I play the Celtic harp for many events in the area, and Snowbird makes an excellent and very regal resident harp dog. He has attended weddings, cocktail parties, brunches, concerts, black tie events, and country clubs. In addition, he successfully navigates high school, and performs spectacularly in all of his classes! My favorite classes are history and theology, and I hope to become a peace negotiator with an expertise in world religions after graduating from Georgetown’s School of Foreign Service. I love to play the harp, read, learn, play with Snowbird, travel, and sing, and I strive to be a difference in the world with my MIRA miracle at my side. Hi, my name is Lexi and I am in tenth grade. 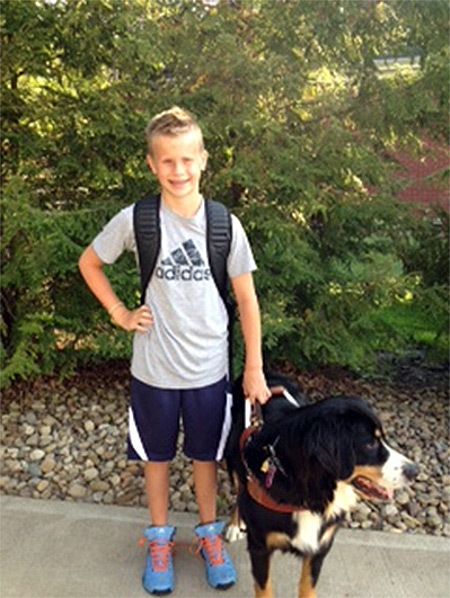 This year, I started a new school with my brand new MIRA guide dog, Cruz. Cruz is just a dream and super helpful to me. We trained together for a month at the MIRA headquarters and I can’t believe we learned so much. We have truly bonded and that is just super. With Cruz, I can go out by myself for a walk in my neighborhood. I couldn’t do that before I had Cruz. He helps me find my way around school as we go from class to class. I knew guide dogs could be special but I never knew how very special. He is truly changing my life for the better. My family loves him and I do believe he loves them, too. I love being a teenager and I love it even more with Cruz. I can walk in the park and the mall now with my friends with Cruz to guide me. I love fiction stories and I love to sing. I think I could say singing is a passion for me. I enjoy traveling and I have been to China…quite an experience. With Cruz, I think traveling will be easier, for sure. It is just super to be able to go outside without having to hold on to someone’s arm. Cruz makes it easier for me to find my way from classroom to classroom in school. Cruz is a special gift, a loyal companion and just one neat guide dog that is changing my life, step by step. 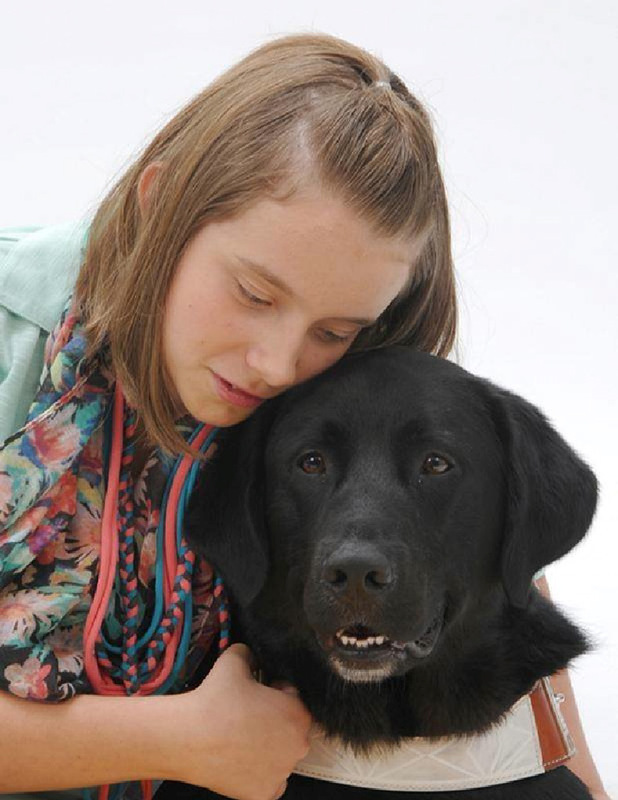 Hi, I want to tell you a little about life with and without my MIRA guide dog. Before I got my dog from MIRA, I was alone. I had no friends, althought I was popular. I guess everybody liked me but no one wanted to talk to me or hang out with me. It made me challenged socially and it was pretty lonely. I was also challenged with the cane, bumping into people and tripping them, smacking into walls and overhangs, and getting the wind knocked out of me when my cane hit a crack in the he sidewalk and plunged into my stomach. Training was hard but exciting and when I got back from and started high school, everyone was all over me! Things were said like, “Wow! Nice dog!” and “How did you get her? Where did you get her? How old is she?” and of course, “What is the dog’s name? and “Can I pet her?” I was truly unaware of how much a boy magnet this guide dog was until a boy came and sat with me at lunch just this past week! I am in a program at Stanly Early College, and I will complete my high school and associates degree in four years. There is not one day that goes by that I do not learn something about my dog, Steady Allie. She is truly a blessing to me and she has changed my life for the better. She is a multi-purpose dog! She is my blanket, my pilliow, my baby, my fan when she wags her tail, my friend, my sweet big old cuddlety teddy bear and, of course she is my eyes. I love her so much and I am so happy with my life now with her! My name is Kate and I’m thirteen. I enjoy reading, writing fantasy stories, studying the Elizabethan era, and being independent. For almost as long as I can remember, I’ve wanted a guide dog. When I was nine, I learned that I couldn’t have one until I was sixteen. So when I found out about MIRA, I was awestruck. 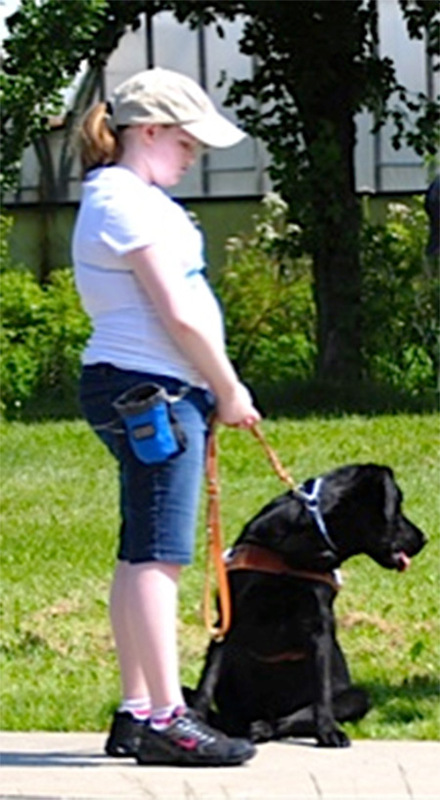 A guide dog for a thirteen-year-old? In the way I’d been thinking, this seemed unthinkable. But it had been thought of and this wonderful thing brought Valerie, my beautiful guide dog to me. I love having a guide dog in my life, because it allows me to be more independent. Now, I don’t always need a sighted guide, I can be the leader. Soon after receiving Valerie, I remember going on a walk with my friend. I remember her offering her arm, but I was already gone. I had walked quickly down the sidewalk, satisfied. My friend ran to catch up to me, making me laugh. I also find that Valerie makes me feel more confident in where I am going. When I walk out to go somewhere, I think, “Okay Valerie. If I mess up, we both go down. So I won’t mess up.” And then I take the harness and I’m off. Watch out because I’m coming!